If we say we have fellowship with him while we walk in darkness, we lie and do not practice the truth. But if we walk in the light, as he is in the light, we have fellowship with one another, and the blood of Jesus his Son cleanses us from all sin.—So rejoice in the LORD and be glad, all you who obey him! Shout for joy, all you whose hearts are pure!—Evil people are trapped by sin, but the righteous escape, shouting for joy. Sin looks like freedom to choose but it enslaves. Righteousness can look like restriction; it can even be painful, but it frees. Our heavenly Father disciplines us in love in order to produce the peaceable fruit of righteousness. He is a good, good Father and the very best Master to serve. And the rewards are beyond anything the world can offer, among them is JOY! 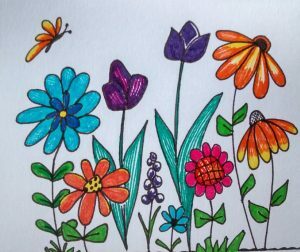 Are those your happy flowers in the drawing? God has gifted you in manifold ways. You must enjoy encouraging the artistic efforts of your grands.